The Ninth Annual 48 Hour Book Challenge is coming up the weekend of June 6 through 8. What's the 48 Hour Book Challenge, you ask? To put it as simply as possible, lit bloggers read furiously and then blog madly about it, trying to stay conscious for as much of a 48-hour period as possible. Back in 2008, my third year taking part in the Challenge, I said I found it more satisfying when I had a theme. This year, Pam Coughlin/ MotherReader, the Challenge's creator, has chosen a theme, diversity for children's books. She's encouraging participants to support the We Need Diverse Books campaign. I haven't kept up on the We Need Diverse Books issue, but I'll have to bring myself up to speed because, for the first time since 2008, I believe I'll be able to take part, at least from Saturday afternoon until Sunday night. I'm feeling cautiously optimistic. I may get to play with my blogging buddies. This sounds like fun. How does a blogger join in? 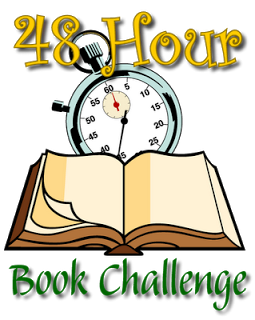 Stacy, Follow the link to the 48 Hour Book Challenge announcement at MotherReader's blog. She's asking for sign-ups in the comments. It looks as if there will be a starting line sign up on June 6th as well. When you blog about your reading that weekend, you can share links to your posts on your Facebook page and on Twitter using the #48hbc hashtag. Always fun to play in the sandbox! I get a lot of reading done during these! Thanks for posting; I hadn't heard yet that it was on.